Zero waste initiatives are blossoming in Brussels like never before: conferences, cafés, workshops, festivals... Is this trend, aimed at decreasing the volume of waste we produce, the latest hipster fad in the European capital? Or is it an authentic peak in awareness on how our consumption patterns affect the environment? Cafébabel wandered through the streets of Brussels to meet these new environmentalists. Have you ever come across a photo showing an island of garbage floating in the middle of the ocean, or a turtle with a plastic straw stuck in its nose? For about a hundred of Brussel's inhabitants, photos like these were the final straw. Last April, excessive wrapping led to a 'plastic attack' in a Delhaize supermarket in the city. This phenomenon, which originates from Great Britain, is now taking over the entire Old Continent. But what does it entail? Well, you do your groceries, you pay, then you remove all the unnecessary wrapping and put it into shopping carts so as to confront distribution companies with the absurdity of their packaging policies. "We need to overcome this psychological barrier"
Like these environmental activists,Sandrine, Victoria, Pauline, and Florian decided to take action and fight a 21st century plague: the abundance of plastic. So when Florian, 30, got involved in opening a grocery store, he wanted it "to have a positive impact on the environment." And it worked. His supermarket Day-By-Day – a French franchise that specialises in zero waste – opened seven months ago in the charming neighbourhood of Saint-Gilles, and is already at full capacity, attracting more and more customers. No need to deal with the plastic wrapping that comes with your favourite cereal, all you need to do is fill your jar to make the step towards a greener planet. With his round glasses and checkered shirt, 26-year-old Arthur explains that bulk buying is "a psychological barrier we need to overcome". As soon as preconceptions on the sanitary and practical aspects of bulk buying are demystified, it becomes clear that it's just as easy as doing your groceries at a regular supermarket. 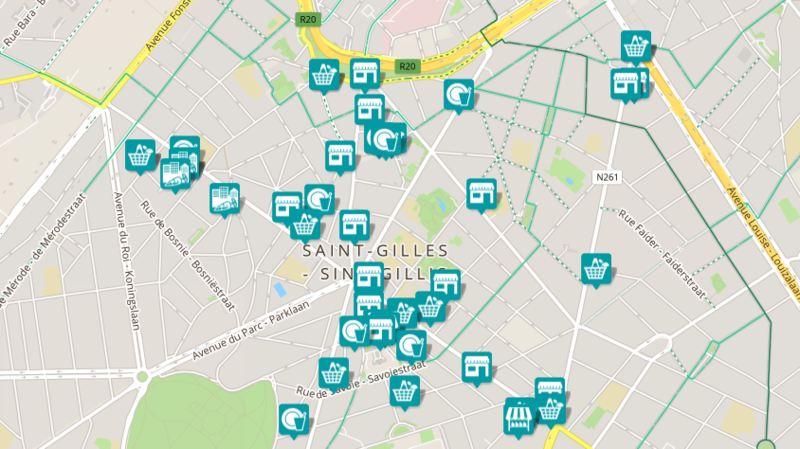 In this fancy Brussels neighbourhood, you don't need to walk far to find a bunch of bulk stores. Sadly, Arthur has to "spend 40 minutes walking to get here". Zero waste initiatives might be spreading, but they are still confined to a handful of neighbourhoods with a guaranteed clientele. That's exactly why two young women from Brussels took the gamble of opening a zero waste café on the other side of town, in Schaerbeek. Victoria, 24, and Sandrine, 25, greet us with big knowing smiles in a cosy atmosphere. Glass jars sit beside cloth napkins, among colourful benches and sofas. Holding a hot cup of coffee in her hands, Victoria explains: "We could have opened this coffee shop in Ixelles or Saint-Gilles, where our clients are, but what would be the point of investing so much of ourselves in a project that doesn't end up shaking things up. We chose this neighbourhood because of its cultural diversity, and we feel like we're starting to see change." Located on the picturesque Colignon square, Victoria and Sandrine offer coffees to go in returnable jars and cold drinks with aluminium straws. They plan on organising a workshop to raise awareness about zero waste, and hope to "reach a larger audience." "Most people come from wealthy neighbourhoods. We're not reaching the general public." The Zero-Waste Belgium association has been organising zero waste workshops for almost two years. But Pauline – the founder of the association – confesses: "Most of the people who come [to the events] are women around 30 from rather well-off backgrounds. Most of these people are already aware of the issue; we're not reaching the general public." Europeans generate an average of 475 kg of waste a year, but there are some inequalities. Despite the grand speeches and environment-frendly slogans of the Western policies, the wealthier the contry, the more waste it generates. As a result, Germany, Luxembourg and Denmark are the leaders when it comes to waste (660 kg per capita on average in 2014). Belgium ranks among the European average (435 kg per capita in 2014) but there's still a long way to go. The 1.2 million Brussells inhabitants produce around 345,000 tons of waste a year, among which only 40% are sorted (data from 2014). On average, Europeans generate 475 kg of waste a year, but there are some inequalities. Despite grandiose speeches and environmentally friendly slogans from Western politicians, the wealthier the country, the more waste it generates. As a result, Germany, Luxembourg and Denmark are the leaders when it comes to waste (660 kg of waste per person in 2014). Belgium ranks among the European average (435 kg per person in 2014) but there's still a long way to go. Brussels' 1.2 million inhabitants produce around 345,000 tonnes of waste a year, of which only 40% is recycled (statistics from 2014). Consequently, the city reacted and decided to take action. As part of a wider framework of European policies on waste management, the Brussels-Capital Region launched a "Zero Waste Plan" in March, publishing a brochure providing "simple advice that will have a significant impact." The city's communes have embraced the initiative wholeheartedly. In Schaerbeek, for example, a "Zero Waste Fair" was organised on the 28th of April to inform the public about the project using an interactive approach. Bulk bag tailoring, jar decoration, workshop on how to make your own dishwasher powder and a zero waste apéro; everything was geared towards "inspiring people and motivating them to take things into their own hands," says Christelle, an employee of the eco-council in Schaerbeek. The event was a success: "We feel as though there's a willingness, a request coming from the citizens." According to a public survey commissioned by the City of Brussels, 9 out of 10 inhabitants say they already take actions at home to generate less waste. This survey revealed the fact that 3/4 of Brussels' inhabitants are actively taking part in reducing the amount of waste they produce, but also confirms Pauline's observation – that the majority of these people are employed and educated women, who live in a house with a garden. Those who don't take action are, for the most part, young and unemployed men who are less education, and who live in neighbourhoods like Molenbeek or Jette. In these "rehabilitating and sensitive neighbourhoods", the representative of the eco-council explains, a programme to "raise awareness via link actors – the CPAS (Public Centre for Social Action) or the Women's House – which people already trust." The goal is to "reach a larger public, so that people can take things into their own hands." Without directly mentioning zero waste, the essential goal is to show them that they can change their consumption habits. That's why Sylvia Droulans, mother of two young girls, travels throughout Belgium to explain to people that a zero waste lifestyle "is neither frustrating nor constraining" and that it's possible to live "an ordinary life – work, school, social life, etc." by making "other consumption choices." She also gives tips and tricks on daily chores, such as replacing cleaning products with white vinegar and essential oils, or using washable cotton pads to remove makeup. Simple changes that benefit both the plant and your wallet. Some of her advice, though, may seem a bit extreme to beginners, like installing a worm composter in your apartment. The road to reducing the volume of our waste might seem long, but the day will come – Sandrine hopes – "when aluminium straws will seem as normal as tin cans."